From time to time we use resources and need to source resources. This page is designed to provide our members and friends with access to resources to help with personal and Spiritual growth. If there is anything here that you would like, use the contact section in the HOME PAGE to inquire about or order resources. 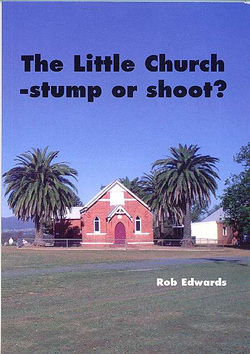 The Little Church, Stump or Shoot? This little book was written by Pastor Rob to help churches, particularly small churches to review where they are and what they are doing in reference to their identity as a church of God. Many people have found it helpful in reviewing the direction of their churches. You don't need to be in a small church or rural church for this book to be useful. the basic principles are the same for any church. Tim, can you say ‘Mum’? This true story documents the miraculous recovery Tim has made since his tragic accident 9 years ago when he was catapulted off his motor-bike. It also documents the mother’s deeply personal journey as she learns to cope with the single most complex and heart-breaking experience of her life. It is a story of hope and healing.